LOS ANGELES – Los Angeles Lakers guard Kobe Bryant told Yahoo Sports that the Brooklyn Nets' signing of openly gay center Jason Collins will have a "domino effect" that will impact much more than the gay and sports communities. Collins became the first openly gay athlete to play in one of America's four major sports when he debuted for the Nets against the Lakers on Sunday night. 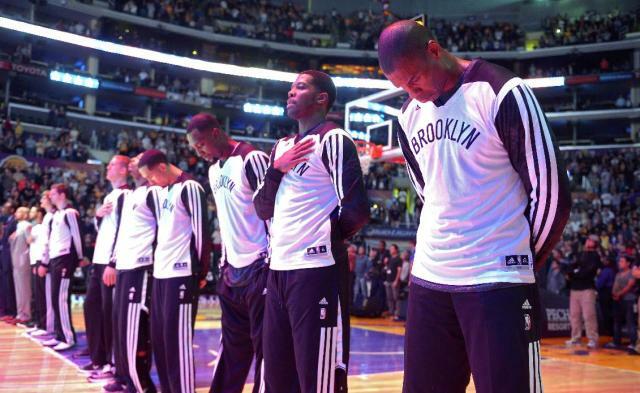 The Nets signed Collins, who announced he was gay on April 29, to a 10-day contract on Sunday. Bryant has been a strong supporter of Collins since his announcement. 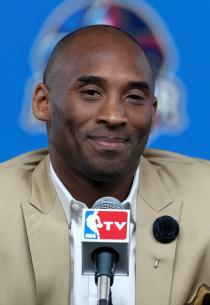 "His impact [Sunday night] is greater than what people think," Bryant told Yahoo Sports before the game. "You look at it from the context of having the first openly gay player. But they missed the domino effect that it has way beyond sports." Collins, now in his 13th season, was a free agent at the time of his announcement and the Nets were the first team to sign him. Bryant said his initial reaction to Collins signing with Brooklyn was, "It's great. Let's hoop." Along with having an impact on the gay and sports communities, Bryant says the news teaches the youth "it's OK to be yourself" and will motivate people from all walks of life. "It's fantastic. It sets an incredible precedent," said Bryant, who is currently out of the Lakers' lineup indefinitely with a knee injury. "I think the most important part about it, what I've learned on the issue is that one person coming out is showing this type of courage that gives others that same type of courage. "It's dealing with a lot of issues for kids who are afraid to be themselves. Afraid to be themselves because of the peer pressure that comes with it. A lot of these kids have depression issues or they're being teased from other kids for being different. You wind up seeing a lot of suicides, kids injuring themselves and getting hooked on things that they should not be hooked on." On the impact of Collins' first game, Bryant said: "There is a kid out there who … is going to say, 'Jason gave me strength in dark moments to be brave. He gave me courage to step up and accept myself for who I am despite what others might be saying or the public pressures. He gave me strength and bravery to be myself.'" Collins, who was scoreless in 10-plus minutes of action, said in response to Bryant's praise, "That's along the same lines of what I would say to every other professional athlete. ... Realize that there is support there waiting for you. That's the only thing I can say about encouraging people to be their true self." Collins' twin brother, former NBA player Jarron Collins, also attended the game. Jarron Collins exchanged pleasantries with Bryant before the game and thanked him for supporting his brother. Jarron got a call from his excited brother that he was signing with Brooklyn early Sunday morning. Jarron Collins says he and his brother have not talked much about the groundbreaking aspect of his signing, nor does he expect his brother's story to be just a basketball story for a while. "He is a basketball player given a basketball opportunity," Jarron Collins said about his brother, whose first home game is scheduled March 3 against the Chicago Bulls. "But I realize there is more to it than that. That more to it will go through the news cycle. We'll see when it dies down. But it will pick back up when he gets back to the New York media market. "At the end of the day, different people view it different ways. I view it as my brother is a basketball player getting a basketball opportunity." Jarron says his brother has gained strength since the announcement. Jarron added that concerns about social media also caused his brother to reveal that he was gay which allowed him to control the message. "My brother made an announcement to the world that he is gay, but he is still a private person," Jarron Collins said. "It's not necessarily difficult. He's comfortable with who he is. He did not want to be in a situation where he couldn't control his message or when and if some picture was taken in this day in age of social media."